I sure hope your August was more productive than mine for block making. I have a big, fat ZERO for this month to add to my total. I kinda knew this would happen. I’ve mostly been at the longarm or pattern writing. That doesn’t leave much piecing time. I hope to do much better than that in the coming month. I’ve been working on getting the new Block-of-the-Month quilts ready for Sew Sweet Quilt Shop’s “It Takes Five!” program for this year. It starts on September 9th. I’ll give you a peek at the traditional version of the quilt for this year, and I’ll be back in a few days to tell you all about it, plus the modern version of it as well. So . . . now it’s your turn, and I hope you have a much better report than I do! How many blocks did you make this month? Our random number of blocks to complete for September is 42, for a year-to-date total of 274 by the end of September. That way, we can take it a bit easier heading into the holidays. (Did I just say holidays? Eek!) Check out The Project Page to see all the info. Our prize winner for July is KT, who is already up to 331 blocks, so she can just kick back this month and relax! Just leave a comment or email me and let me know your new totals (or if I have any errors in the totals you’ve already reported), and have a wonderful stitchy September! I’ve done 87 blocks for August. My blocks for August total 43. Since I have been missing the last couple my total for June & July totaled 75. Um, I have been traveling. I can only remember doing 5 blocks. But, camping season is almost over. . . .even though there are still not many weekends open in my datebook. I am hoping to do better next month. Maybe watching Project Runway will get me back in the groove! 230 blocks for me this month. It helped that I was under a very short deadline to finish 17 lap size quilts for gifts to be delivered on September 7. 🙂 They are all finished now and ready to give to give to my family when we get together next week. Managed to get 2 completed. Big move, downsizing, rearranging and then planning! Managed to get 3 more cut out so should be up and running for September. Not a great year for quilting but a tremendous year for restructuring. Very grateful! 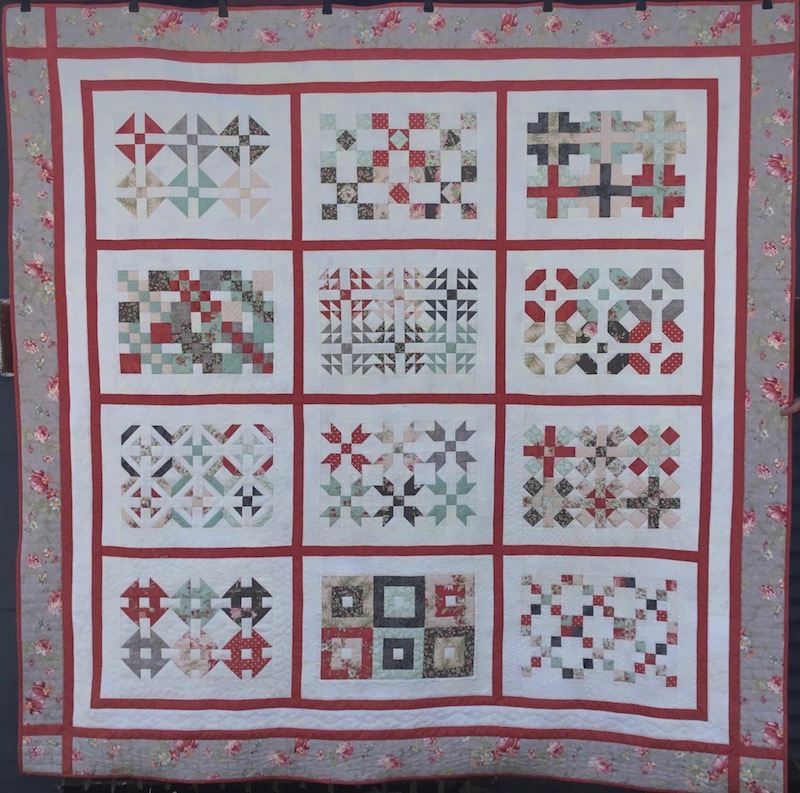 Great block of the month quilt–thanks for sharing! I got 60 blocks made in August. Now that it’s cooling off I need to get some of those blocks turned into quilts! I made 45 blocks in August. I spent more time sewing blocks into quilts this month. I only got 53 done this month. Need to make 3 more to finish the blocks for a lattice quilt. I got 23 blocks made in August. Been busy sewing dresses, burp clothes, etc for new granddaughter due November 1st. Going to be grand baby number 8. I finally got to spend a little time in my quilt room. I made 38 blocks. I need one more row to finish the second tshirt quilt (which I count as one block) and I have pieced all the blocks needed for a lantern quilt top. It is ready to sew the rows together. I feel better now! Just 17 blocks for me for August. I had some sewing time. Now my Gypsy Wife top is completed let’s see what happens during September. I finished 28 blocks in August. I’m anxious for more sewing time when fall gets here. ? I knew August would be a little slower with school starting, but 37 blocks were still added for a total of 449. If I stay on track this will be my most productive year since I began keeping track with you in 2013. Aww is ok Shelly, some months are like that. I did 6 string blocks, 12 big rainbow strippy blocks (and finished the quilt), plus a 35 block quilt start to finish. Happy dance. Total of 53. I completed 205 blocks in August. I managed to get 28 blocks sewn this month. 16 more for a swap and then started another Arkansas Crossroads top. Made 12 blocks so far. Actually more now but 12 for August’s count! And sewed the binding on 2 quilts while it rained over the weekend thanks to Harvey! Will be getting those and others off to Quilts of Compassion next week. Think that takes me to 392. I never bothered to keep track before. This is fun! 39… I had some concerns when the count was 9 on August 28th but a total kitchen gutting with holes in the floor and heat vents being moved and well tank coming inside and walls being moved… caused me to flee with my sewing machine and some serous block making resulted. …. I completed 45 blocks for August. More trips on the road keeping me away from sewing. Did a shop hop and several row-by-row shops. Makes a long day driving/riding. Found out about another shop hop west of us this coming weekend, maybe will make it. Husband and I are a glutton this year with the driving trips. For August block total is 36. I got 73 done. Those improv blocks go together fast and furious! I did 189 for the month of August, making my year to date total 564. I think my last update was in April. I finally found my little slip of paper with May, then accounted for June, July, and August. I had 201 blocks for August. I finished 83 blocks in August. Somehow, that doesn’t feel like the right number, but since I alternately feel like it should be more or less, and the numbers are written down in black and white, it must be right! Just 7 for me this month what with all the traveling I did and the Lost Days of Missing Mojo. Your new quilt is lovely. I know this is probably late but I did 25 blocks in August. I plan on doing more in September and now that I realize how to participate I’ll be letting you know my number much earlier. I made 48 blocks in the month of August. They were the Metro Rings where you use the curved ruler. Glad to get past those. I’m not one of the ones who may have done more than you. I also have a big fat zero. Now that it’s cooling off maybe I’ll be able to focus on sewing…maybe. I have had 60 blocks this month. I finally got back to sewing some this month, although it took a while to cut all the blocks. I got 18 blocks done in August. Hope to be more productive in September. I hope it is not to late for total…6 blocks for Aug. Still working on dresses for granddaughters in between finished knitting baby sweater for newest granddaughter. My totals for June, July and August are zero. 25 blocks done on my star. Sorry I’m late. This summer has been very busy!